MILOVE, Ukraine -- A dog barks and crosses the street in Milove, in the eastern Ukrainian region of Luhansk, 10km (6 miles) from the conflict zone. 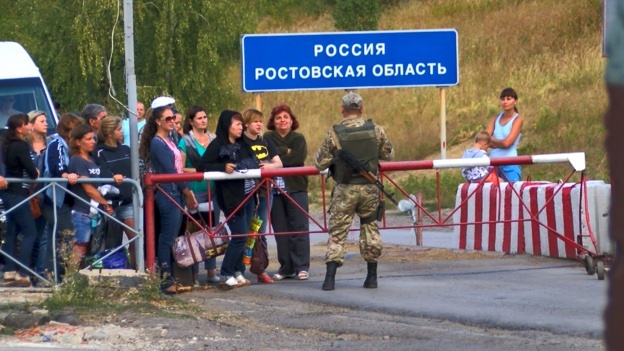 On the outskirts of Milove, residents wait to cross the official border between Ukraine and Russia. This could be anywhere in Ukraine. But Friendship of the Peoples Street belies its name because, on the other side of the road, lies the Russian town of Chertkovo. If the dog's owner were to go after it, in theory he could be detained for illegally crossing the state border. And there is little love lost between the two countries. A fragile ceasefire is in place, but some parts of the Luhansk and Donetsk regions are still witnessing clashes between Ukrainian government forces and pro-Russia rebels. Some food stores on the Ukrainian side take Russian roubles and attract Russian customers, who largely ignore the legal requirement to take purchased goods through an official border crossing point on the outskirts of Milove. "Why don't they use their own shops? Because it is cheaper in Ukraine, and Ukrainian sausage and butter are tastier," jokes one resident. Local border guards do not mind as this area is relatively peaceful. However, when the conflict between the Ukrainian army and pro-Russian separatists was at its fiercest you could hear the guns and some residents spent the night in underground shelters. A year ago a Ukrainian border guard office was shot at with a grenade launcher. Since then nothing much has changed other than more troops patrolling the streets. Residents still cross Friendship of the Peoples Street. Ukrainian and Russian border officials used to meet and discuss co-operation but they stopped talking when the conflict worsened. Russians have installed CCTV cameras on their side of the border. The government in Kiev plans to build a wall to enforce the border with Russia and work is due to start next year. There is little enthusiasm among the inhabitants of Milove for a wall that will separate them from their neighbours on the other side of the street. 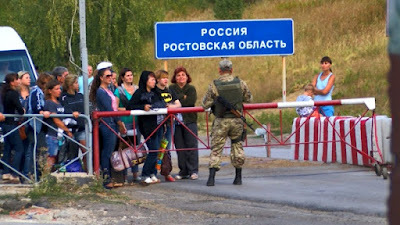 The Ukrainians already face stricter border controls and the Russians are not supposed to cross with only their internal ID cards. It is bad news for Valeri Fedorovich who has for years sold local potatoes to his Russian neighbours. "I don't know what I am going to do with all those potatoes now," he complains. "They are going to spend so much money on building that wall! It would be better to give it away to the people. I used to serve in Germany [in Soviet times], the Berlin Wall didn't stop anyone. The time will come and all the walls will fall." "Locals don't feel threatened by Russia," says the head of Milove's administration, Vladimir Mirny. Although they disagree with Russian government policies in Milove, their attitude to the Russians in neighbouring Chertkovo is completely different, he says. "We don't talk about politics. All we talk about is milking our goats and tending our gardens." But the town official accepts that even though the two adjacent towns get along, their annual day of celebration of friendship between two nations has now been suspended. The politics of the conflict for most people here is secondary to the struggle to get through the economic crisis. "I am not scared of war if I don't watch TV," says Sergei, who is buying vegetables with his family on Friendship of the Peoples Street. With no job and the prospect of increasing local service charges, he is more concerned about the prospect of winter. Many of Milove's residents are out of work and monthly benefits are barely more than 1,000 hryvnia (£30; €45; $50). Life on the Ukrainian side of the street is a constant struggle. "When you talk to the Russians they support their authorities, trust them - and we live in Ukraine so we should also support our authorities." says Vera. "But power changes hands all the time in Ukraine, and our lives don't change," she sighs.